Our Incredible Dracula: Chasing Love Walkthrough is ready to assist you on your journey of love with Dracula and his love-struck human. Look to our colorful screenshots and helpful hints and tips to guide you through this fun and addictive time and resource management game. 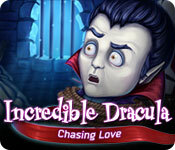 Scope out our Incredible Dracula: Chasing Love Walkthrough to help Dracula outwit his human princess love interest. Brimming with helpful tips and colorful illustrations our guide will help you make good time in this humorously sweet and ghoulish time and resource management game. We hope you enjoy our Incredible Dracula: Chasing Love Walkthrough!